Yet another year has come and gone. It completely floors me how quickly 2017 has flown by! Despite my shock, I am thrilled to tackle 2018. This last year has been a year of immense growth and development for me, and I can’t wait to continue to push towards my goals with energy and enthusiasm. 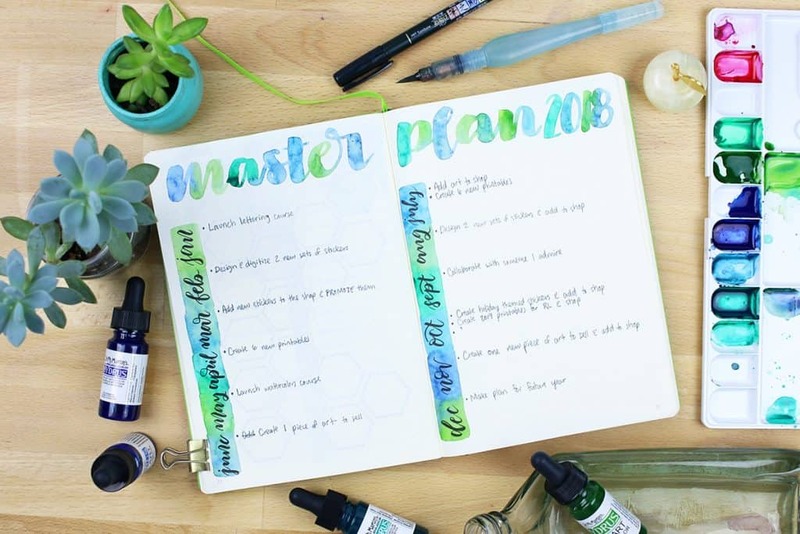 In order to do that, I need to sit down with my journal and get in touch with myself to reaffirm my goals and focus on achieving those goals. So let me walk you through that process with my 2018 bullet journal setup! 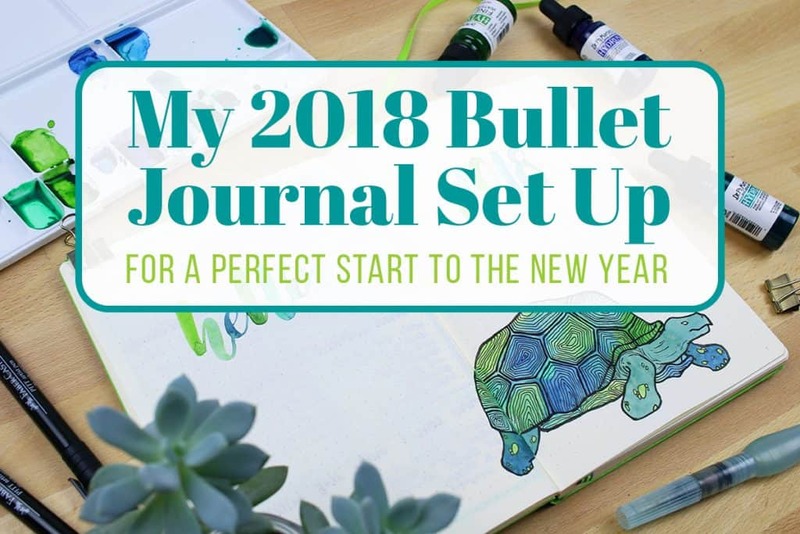 Before I break down each section, check out the full 2018 bullet journal set up flip through! You can see everything laid out exactly as I see it and how it all fits together. And if you want to watch how I set up my spreads (for my 2018 bullet journal and more), make sure to head to my Youtube channel and subscribe! Before I can start jumping into a list of goals and plans, I need to take a step back and evaluate the year in review. 2017 was full of lessons, experiences, setbacks, and successes. It’s important to reflect and take inventory of yourself before you charge into the new year. I created a page to hand letter out a farewell to 2017 with my chisel tip Pitt Artist Pen and some soothing blue and green Dr. Ph. Martin’s watercolors. Closing out the year is a monumental feeling, and there’s nothing like creating an end page to fully capitalize on that. I also wanted to spend some time writing about my successes and my missteps in 2017. It was so nice to take a second to stop and remember some of my favorites from 2017, but it was also helpful to step back and consider what didn’t work so well. To do this, I outlined some boxes with my water brush pen and got to work evaluating my accomplishments, my failures, and my lessons learned. It was an insightful and rewarding bit of writing, and I’d highly recommend it when you’re preparing for the new year! I had a lot of fun on this page. Creating a title page (especially one with art) for the new year is appealing to me because it allows me to meditate on my goals and intentions for 2018. Last year, my mantra was “Done Not Perfect”. This year, my mantra is “Slow and Steady” – hence the tortoise. I decided that I wanted to focus on my daily growth and daily action instead of my overarching goals. I want to instill the spirit of determination, focus, and patience into my life over the next year. On the next page, I decided to create this simple and elegant 2018 thumbnail calendar. I already have an active future log over in my watercolor planner, which I’m keeping alongside this bullet journal for my dailies and monthlies. My new 2018 bullet journal is more of a collections journal, which works beautifully with my watercolor planner. Anyway, I really enjoy keeping a thumbnail calendar because I’m a very visual person. If I am trying to plan out trips or other events, it helps me tremendously to be able to actually see several months at once in a calendar form. Creating a thumbnail calendar just makes sense! The Level 10 Life is not a new spread for me. In fact, I’ve done it two or three times over the last few years. I used to do it every six months, but this Level 10 Life was actually the first one I’ve done in a full year. It was exciting to be able to think about my satisfaction in life and see how it has changed over the last year. I’m happy to report that in most facets of my life, my happiness has remained unchanged or grown! 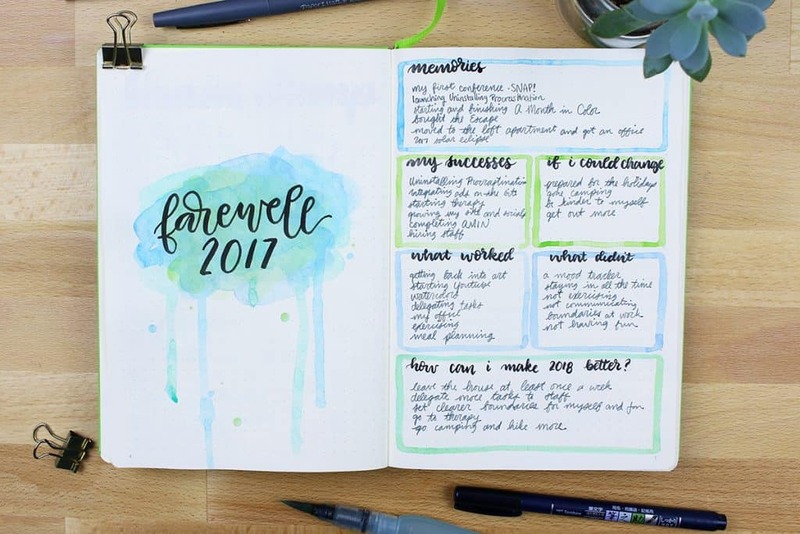 It’s another method to reflect on the past year and take stock of what’s going on in life, which makes it a natural spread to do in my 2018 bullet journal setup. When you’re thinking of all the things you want to accomplish in the new year, it’s easy to get lost in a haze of incomplete thoughts and ideas. 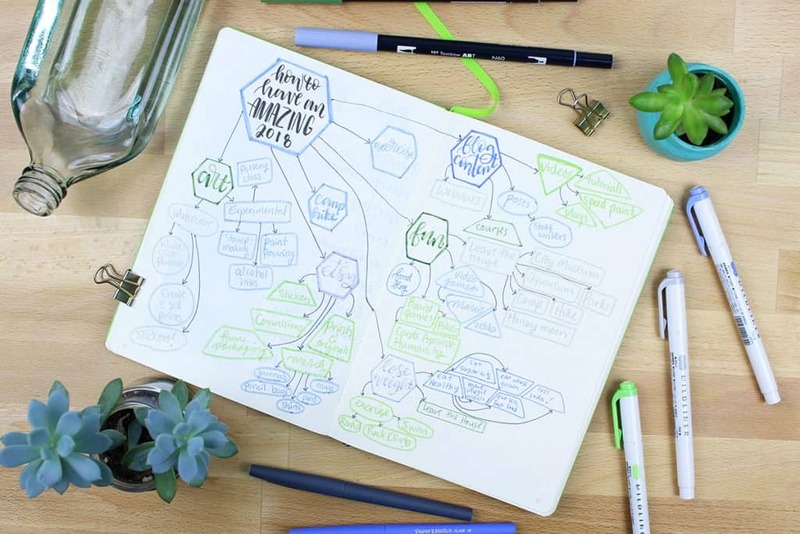 That’s why I wanted to add a mind map to my 2018 bullet journal setup. This technique is perfectly suited for nebulous thought patterns and helps you trap abstract thoughts on paper. It’s a fantastic way to brainstorm your future plans for the new year! It’s also a fun way to play with your large assortment of fineliners, mildliners, and felt tip pens. I’m not really interested in setting new year’s resolutions. I’ve never really had much success trying to achieve new goals right out the gate of a new year. However, that doesn’t mean that I don’t want to think about things I want to change in 2018! I just like to frame my goals a little differently. As I move forward in 2018, I know that I want to hit these particular goals. I don’t want to set my expectations too high, but I’m confident that if I concentrate my focus on this group of habits one day at a time, I can create some real change in my life. If there’s one thing I definitely want to focus on in 2018, it’s my cleaning habits. I admit it – I’m horrible at cleaning. I can never find the time for it and I never have the energy to get it done when time does open up. That is something I want to change. I created this cleaning calendar in my 2018 bullet journal setup hoping that with structure, I can grow a habit of regular maintenance cleaning instead of rare cleaning frenzies. I want to have a calendar in place so I can know what to do and when to do it. I’m not expecting for me to become Martha Stewart overnight with this cleaning calendar. I don’t even expect any significant growth for a few months. But I am hoping to achieve tiny growth and progress day by day. Like my 2018 mantra – slow and steady wins the race. One of my favorite spreads in my 2018 bullet journal setup is my ideal schedule. I feel as though I am constantly battling time, so this thought exercise was especially effective. When you think about your big dreams and goals, it only ever comes down to your daily life and daily actions. Thinking about your dream schedule is just conceptualizing what your dream looks like on the ground level. That’s what makes it especially fun! I like doing this at the top of the new year because it brings your favorite activities and values to the surface. When you think about it, what are the things you would want to do in your ideal day? What would you spend your time on? That’s your passion, and that’s your goal. Getting that down on paper helps make far away goals feel closer to reality. This exercise makes it much easier to draw a line from your current life to your ideal one, and that’s a powerful tool. I’ve gotta be honest with you – I’ve put on some weight. I’ve slowly added about 20 lbs to my frame in the last year, and while it might not be a ton of weight, I decided to make a plan to tackle it. 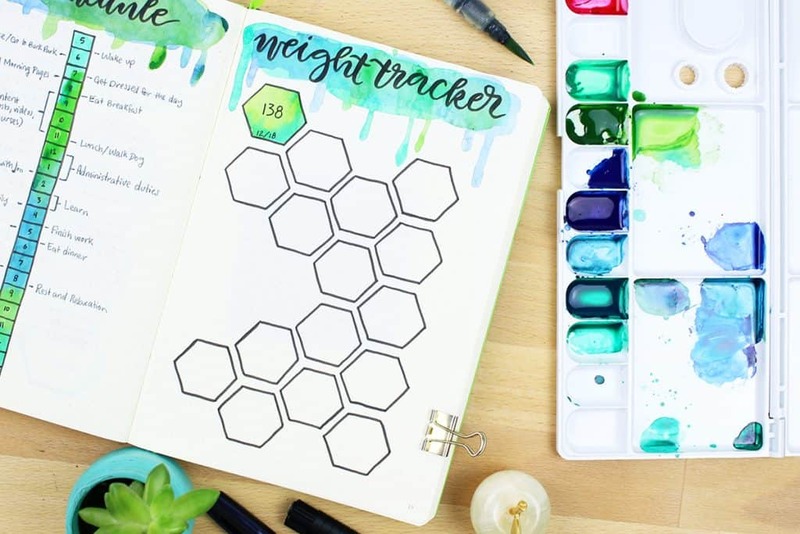 That’s why I created this extremely simple weight loss tracker in my 2018 bullet journal setup. All I did to set this up was draw out several hexagons with my Tombow Fude brush pen. The idea is that I weigh myself every day and average out the scores for each week to get my number, which I write down in my weight loss tracker. I’m not devoting myself to becoming a health guru in 2018, but I do want to practice some serious self-care by maintaining my health. And getting myself back to a comfortable and healthy weight is an excellent place to start. While I don’t want to set any sort of a daily new year’s resolution, I did want to setup a master plan of milestones in my 2018 bullet journal setup. It’s so easy for days to roll into weeks, then weeks into months. Goals can slip by and be forgotten quite easily if you don’t have a plan (or even sometimes when you do). That’s why I am trying out this new type of master plan. I decided to only pick one high-value goal for each month in 2018. These goals are high value, but none are particularly difficult or time consuming. I should be able to accomplish each of these goals in 6-12 hours, which is nothing in the span of a full month. Setting these achievable goals gives me something to work toward each month for a feeling of growth and success. And if I decide to add more goals later on as I make progress, there is certainly room to do so. It feels like a win-win! The last page in my 2018 bullet journal setup is this a year in pixels spread. 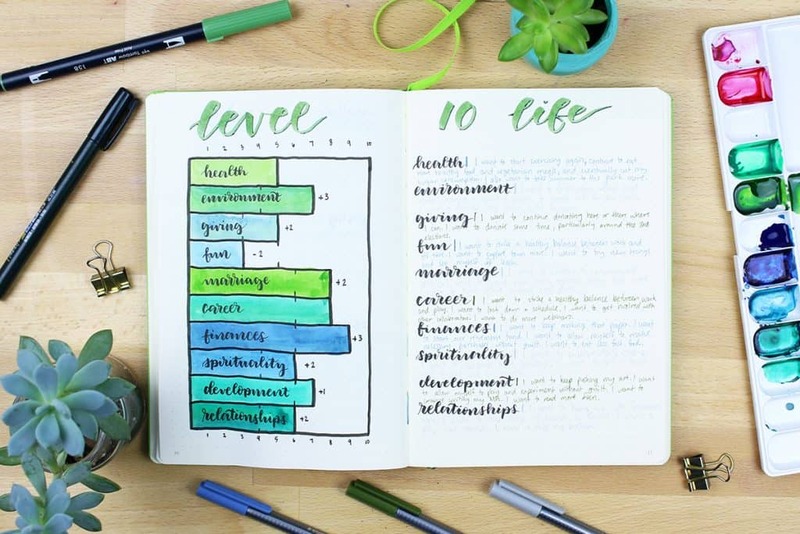 It’s a gorgeous chart that I’ve seen in the bullet journal community for a while, and I’ve been dying to try it out. 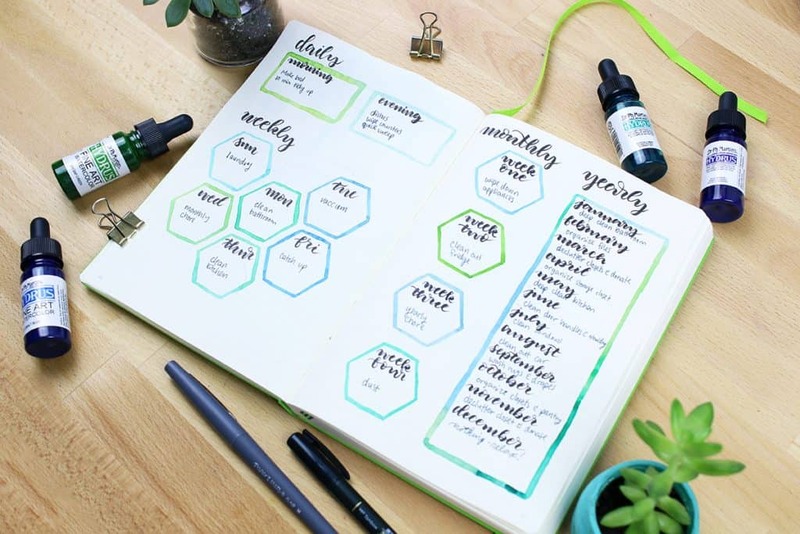 The idea is that you keep data on your moods over the course of a full year in this compact, simple chart so you can identify your mood patterns over time. 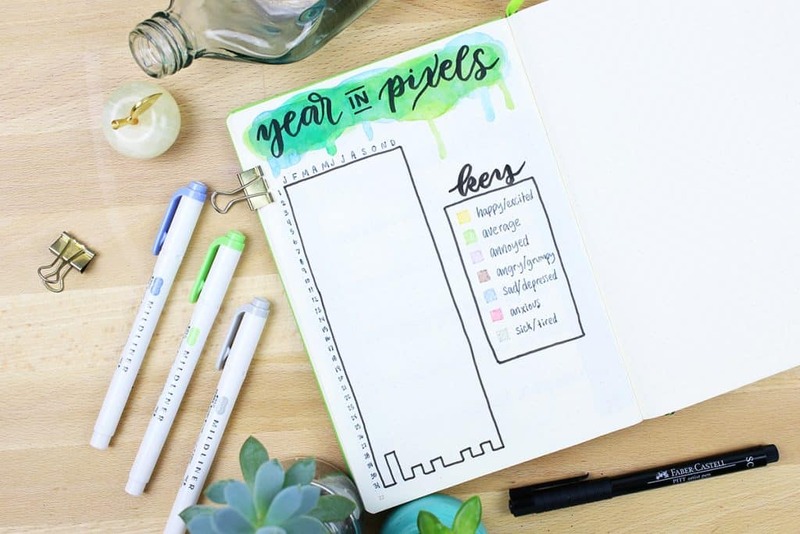 If you’ve seen my habit tracker, then you know I’m a sucker for data, so I couldn’t pass up this perfect opportunity to try the Year in Pixels spread for myself. There’s nothing quite as exhilarating as the beginning of a new year. The allure of a clean slate is intoxicating, and I love being swept up in the hype of future planning. 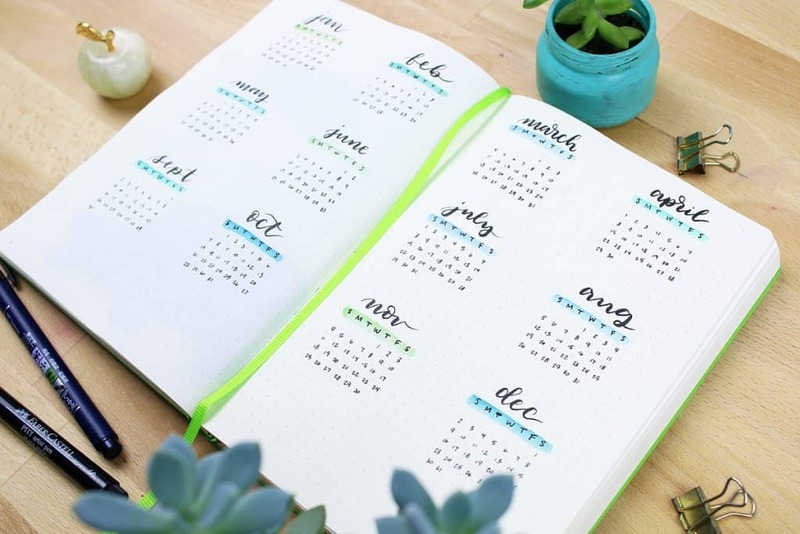 There is so much to look forward to, and I can’t wait to jump into the new year with both feet – thankfully with the help of my 2018 bullet journal. Let’s do this! Check out all of my posts about planning for the new year! Want my 2018 Bullet Journal Printable? This year I decided to create a free 2018 bullet journal printable to help you plan for your 2018 with style! All you need to do to get your hands on this gorgeous freebie is to sign up to the Fox Den Resource Library. 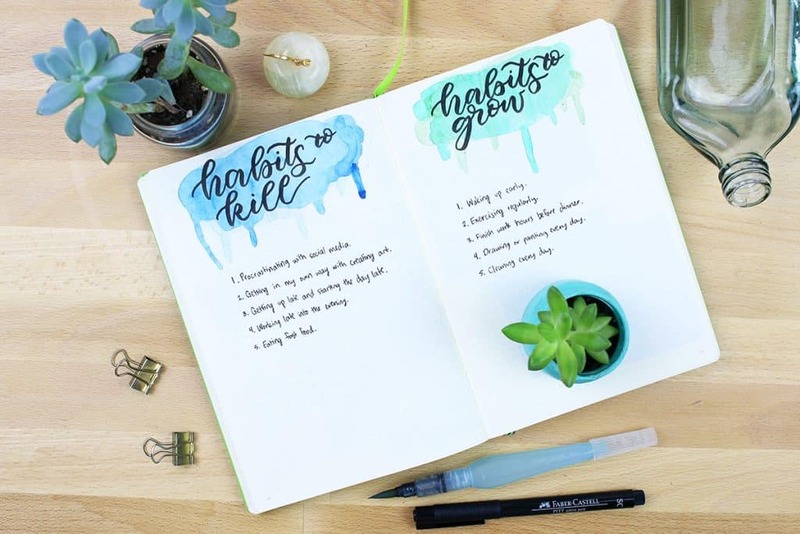 In the Resource Library, you will find tons of other bullet journal printables, brush lettering worksheets, tutorial videos, and much more! I wanted to mention to someone I follow on IG, …..as much as I have scored bujo posts, no one had yet to cover the basics of using a dot grid planner and a general idea of how to plan/ count the dots to make the squares. Maybe I’m not the only one? You’d be surprised what a mental block that can be for some folks. Please do a post about it. Thanks!! Thanks for that feedback KJ! That would be a helpful post to have for sure. Hey! 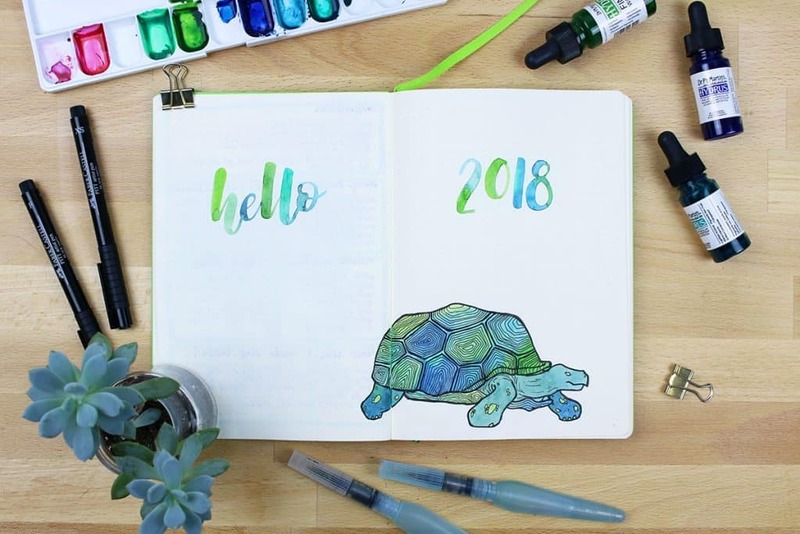 I’ve come back to this post because I’m already mentally preparing for my 2019 Bullet Journal. I wanted to know how to you that really cool water colour wash (is that what you call it?) throughout your set up. I have the same materials and I use the same notebook as you, but when I tried to do it once on my October spread, it completely wrinkled the pages. Any tips you could give me? It’s great to hear this was helpful. Throughout the post, in each section, there are links that will take you to the more in depth explanation of each of the pages you see here. That should give you the details you are looking for! So glad it was helpful for you Tonya! I absolutely love your ideas. I am retired and have recently moved into tiny house living in a fifth wheel. 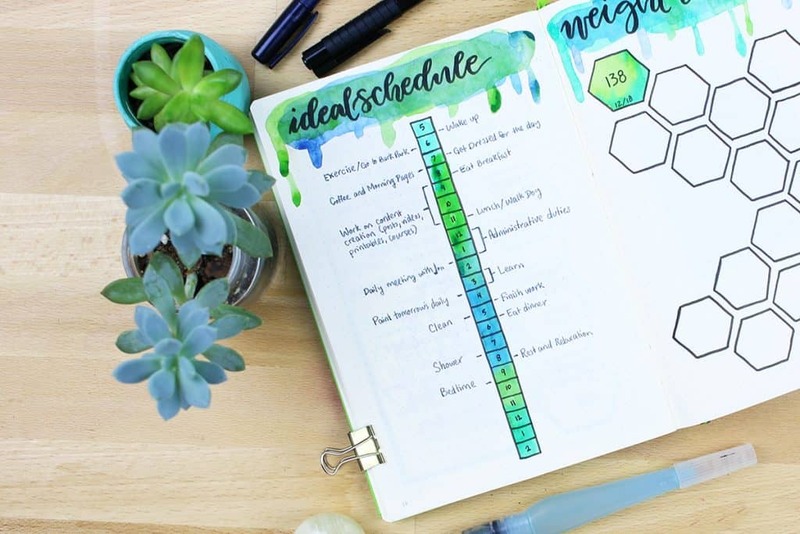 Your ideas have helped me plan my days both schedule my life and my cleaning. I find I am constantly organizing and purging, you have made it so much easier. Thank you. I look forward to your posts and am happy I can now get my inner artist out. Thank you so much Nancy, it’s great to have you here! Pretty nice! I got a lot of ideas from your website and it really helped me a lot! I’m using your habit tracker, gratitude log and morning pages (a bit adapted to my own style, though) since one month and it has helped me a lot. I’m a bit late with 2018 things, but I believe I will take some new year ideas too, like the year in review example. Thank you very much and good luck! Thanks so much Robert! Glad to hear you’ve found so much inspiration here ? Should it be in the “planner printables” category?? Hey Raquel! Yes, that is the right place to find it! It’s the top left one. I’m only seeing the Monthly Headers in the top left. Am I missing something? I can’t find it either. Hey Lisa! There is also the Level 10 Life and Master Plan sheets in there. Beautiful layout and color scheme. Bullet Journaling is my 2018 goal. What journal do you use? Thanks Jess! Right at the top of the post I list the supplies I use, including the Leuchtturm 1917 journal. If you click on the name it will even take you to where you can purchase one if you want! I love the water paint idea and the colours you chose. Beautiful. Also all of my favorite colors! Thank you for sharing. They are some of my favorites too, Tammy! Thanks for reading. Fantastic. Thanks for sharing and the inspiration. Looking to set aside some quiet time to tackle this myself this week. Lots of inspiration around about setting yourself up for next year. Not much for reviewing this one. A valuable exercise. I really think it’s an important part of going forward. Thanks for reading, Claire! This is wonderful! Thank you for being open and sharing the “used” pages, it helped springboard a lot of ideas for me. Your “prepared for the holidays” note – same. I’ve already thought out and scheduled things for next year so I’m not a crazed “why do we have Christmas anyway?” mother next year.